Valley Violet ceanothus is a spectacular UC Davis Arboretum All-Star selection that was introduced in 2010. Davis All-Stars are all tough, reliable plants that have all been tested in the Arboretum, are easy to grow, have few problems with pests or diseases, and have outstanding qualities in the garden. Valley Violet is one of the best small ceanothus for both costal and inland locations. It forms an attractive mound 2-3’ tall and wide that needs little to no pruning after flowering. This plant is covered with dark green leaves and in spring it is cloaked in clusters of dark-violet flowers. Valley Violet can tolerate full sun or partial shade, heat or cold and is resistant to deer. 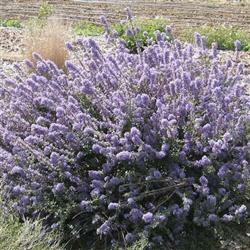 It attracts many pollinators and beneficial insects and makes a great substitution for non-native lavenders. Need we say more?